The Summer Triangle at about 10 p.m. local time in July from mid-northern latitudes. Summer officially arrives at 2:46 a.m. EDT on June 21 (11:46 p.m. on June 20 for those living in the Pacific Time Zone). And as darkness falls this week, the famous "Summer Triangle" can be found low in the eastern sky. This huge, nearly isosceles triangle is composed of three of the brightest stars in the sky, each the brightest star in its own constellation. The brightest is the bluish-white star Vega, in Lyra the Lyre. Next in brightness is yellow-white Altair in Aquila, the Eagle. Finally there is white Deneb, in Cygnus, the Swan. The stars appear in that order, as the twilight sky grows dark. The Summer Triangle is one of the favorite parts of the sky for most sky watchers, perhaps because of its sheer simplicity in contrast to overabundance of bright stars found in the wintertime sky. If you are just getting started in astronomy, and especially as you watch for the first stars to come out after sundown during the coming weeks, you are not very likely to confuse the Summer Triangle with anything else. Moreover, since this area of the sky is far removed from the zodiac, where the bright planets roam, it does not have any strange "stars" temporarily altering its familiar pattern, as Saturn has done to Gemini over the past couple of years. Recently, somebody posed an interesting question to me: "Who was the first to coin the moniker "Summer Triangle?" I did a bit of research and surprisingly, as it turns out, this celestial designation appears to be of relatively recent origin, since it does not seem to appear in any astronomy guides written prior to around the mid 1950s. "Let us suppose ourselves, under the starry vault on a beautiful summer's night, splendid and silent." " . . . three important suns: Vega of the Lyre, Arcturus of Bootes, and the pole star (Polaris), which watches above the solitude of our mysterious North Pole. Many martyrs of science have died looking at it!" Flammarion, however, was not the only one to overlook the Summer Triangle. One of the most popular books on the constellations was penned by astronomer Robert H. Baker (1880-1962), a former Professor of Astronomy at the University of Illinois. His book "Introducing the Constellations" (The Viking Press, New York, 1937), speaks of the "Great Diamond" of Virgo, formed by the stars Spica, Denebola, Arcturus and Cor Caroli, yet makes no mention of the Summer Triangle. In the classic "New Handbook of the Heavens," (McGraw-Hill Book Company, New York, 1941), authors Hubert J. Bernhard, Dorothy A. Bennett and Hugh S. Rice do speak of Vega, Altair and Deneb as a "brilliant triangle composed of three of the 20 brightest stars in the heavens." But in a twist, the triangle is designated not as a summer star pattern, but rather, is described under the chapter "Autumn and Winter Stars," since, as the authors point out, the "big triangle" passes overhead on September evenings. That is indeed the case, although it is only during the summer months of June and July that the Triangle is visible for the entire night, from dusk till dawn. Astronomer Henry M. Neely (1879-1963), who worked at the Hayden Planetarium and who was known as the "Dean of New York Stargazers", made reference to the trio of Vega, Altair and Deneb in his book "A Primer for Star-Gazers" (Harper & Brothers, New York, 1946). "Here," he wrote, "we have three good navigational stars in a comparatively small area of the sky." Yet although throughout his book Neely has a number of charts depicting the positions of these three stars, he never once refers to them as a triangle, nor connects the three into a triangular shape. Oddly . . . Neely later devoted an entire chapter to "The Great Virgo Triangle," which was simply Baker's "Great Diamond" but omitting the star Cor Caroli. So just where did the "Summer" Triangle name originate? "Altair, Vega (in the Lyre), and Deneb (in the Swan) form a huge right triangle, known to all navigators." Still, though, no "Summer" Triangle. "Vega, Altair. 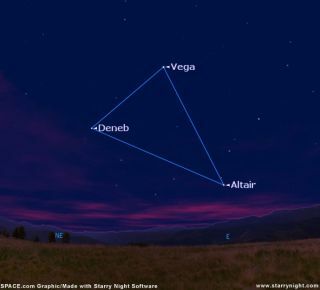 And Deneb form the famous 'Summer triangle,' with a right angle at Vega. All navigators know it. It is easy to find." In 1962, Rey updated "The Stars," incorporating into it sky charts that could be used anywhere in the world (the initial 1952 edition was only useful for midnorthern latitudes). And on six of his redesigned calendar sky charts, are specific notations about the Summer Triangle. What is funny is that Rey always noted that the Triangle was a "navigator's landmark." Probably true enough. He even referred to it as the "famous" Summer Triangle, although it appears at that time the only one who used that title was Rey himself! Over the last half-century, literally hundreds of thousands of Rey's constellation books have been distributed worldwide, "The Stars" having gone through nineteen printings and "Find the Constellations" through sixteen printings. So the term "Summer Triangle" has apparently proliferated far and wide over these many years thanks chiefly to Rey. Still, I'd be interested in hearing from anyone who can locate the name "Summer Triangle" in any astronomy book or magazine written prior to 1954.